Johnnys not done playing hockey yet. He is going to play for USA at the world championships! Wow if that doesn't speak volumes. Kid plays one game in the NHL and is asked to play for his country. Good on him!!! It also helps that his Prez of Hockey Ops is heavily involved in Team USA hockey. The USA is also famous for inviting young players to this tournament. Last year they John Gibson, Nick Bjugstad, Danny Kristo, Jacob Trouba and Drew Leblanc. Its a good way to get players into the Team USA family and get them experience for the bigger tournaments that matter more topeople in North America. Well now I am very confused. Why can the Flyers send Gostisbehere to the AHL but the Flames can't send Gaudreau to the AHL? JH is going to worlds for US. Yeah, but the word was that because he signed after the NHL trade deadline that he was ineligible to play in the AHL. Now Philly signs Gostisbehere and sends him to the AHL. According to this article Gotisbeheres contract is for next season not this season so he is AHL eligible. Gaudrea signed an NHL deal effective immediately. The season was over when Gotisbeheres signed. Yeah, he signed for next season with the Flyers and signed an ATO with Adirondack for this season. I wish that was what Calgary would have done with Gaudreau. With the college kids, they all have to finish their degrees/semesters. Johnny was firm in saying he was going to finish his; he promised his mom. Story about it is on Flames website. Even if he wanted to, he can't play for the Heat and hope to complete the year. BC gave them time off to play in the NCAA Frozen Four, but he hasn't finished exams, etc. He could have if he signed and ATO with his NHL contract starting next season. But it isn't worth potentially losing the prospect. That could have been the straw causing Gaudreau to return to college. Most top prospects get to burn their first year. I didn't mean he wasn't allowed to. I was saying that he had committed to completing his course load and exams. The other guys had to as well, even though they were in their Senior year. I think they wanted him in an NHL game and to get him his signing bonus right away to make sure they got him. Sure he missed out on an AHL playoff run but he gets in an NHL game and the world championships too. I think it worked out ok.
Hokay. So, heres da Earth. Personally would have preferred for him to sign for next year and an ATO for this year but I can understand why it didnt happen. Oh for sure and agree it would have been a more consistent experience than the 1 game in the NHL, each have their pro's and con's, and it doesn't necessarily mean one is better over the other it all depends on what the player takes from the experience and incorporates it into their game. There's never one better way of doing something because each player is different, their thoughts and abilities to adapt are different and are hard to project without any amount of sample size, next year at camp will be a good indication on Johnny. Here's hoping we've learned from past mistakes and are patient with him and all our prospects now and in the future! I think the World's will be a great experience for him as well just like for Monahan, I'm looking forward to May! My hope is that he spend a good portion of the offseason doing some serious weight training. It's important that he add some muscle to his frame, since he will need to outskate and outwork players on the other teams. I think a "strongly encouraged" enrollment to Gary Roberts' High Performance Centre should have been part of the contract signing. Hey as long as it doesn't take away from the way he plays his game and his agility I'm all for it, build some core strength and a bit of leg strength, if he's able to take full advantage of his lower center of gravity and slipperiness I can't see him needing to get muscle headed. Damn that would be awesome I could use some of that myself! I think the core strength would help him fighting for the puck more than the bone-crushers. His slickness and skating will help him avoid those. The Gary Roberts training would benefit him in making the transition to a longer schedule. Guys like Cammi take training to a new level, and I would hope that Johnny Hockey dedicates himself to fitness. Has that been announced somewhere? 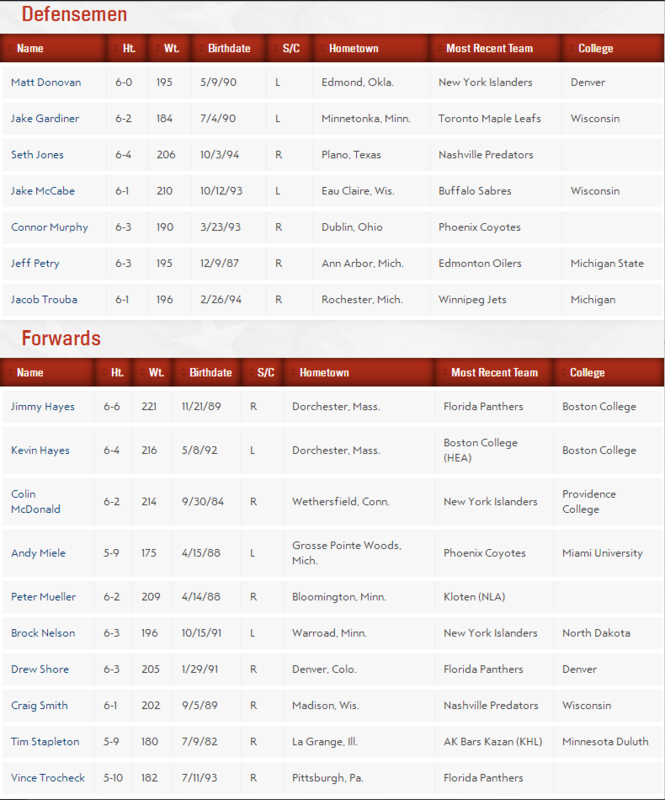 The only list I have seen of 15 initial invitees includes the two Hayes' but not Johnny Hockey. Forget where I heard it. Might have been the fan 960. Seems others have heard same thing.. I don't see him on the list on the USAHockey roster webpage however. Forget where I heard it. Might have been the fan 960.Seems others have heard same thing.. It could be conditional on if he finishes his current classes for the semester. Who knows, but his family advisor (most likely turned agent now) could have shed some light on timelines and the decision hasn't been made yet. The full roster hasn't been announced, I'd still give it some time. Worst case scenario is he doesn't play. If that's the case, then oh well. CALGARY, AB -- Johnny Gaudreau's whirlwind season will continue as he has been named to USA Hockey's 2014 IIHF Men's World Championship roster. The tournament takes place May 9-25 in Minsk, Belarus. It will be the third time the winger has represented his country in an international tournament. He scored two goals and four points for the Americans in the 2010 Ivan Hlinka Memorial Tournament, which the USA placed second in that year. Gaudreau also helped his country capture gold at the 2013 World Junior Championship and led the tournament with seven goals scored in seven games. The 20-year-old recently wrapped up his collegiate career with Boston College, opting to turn pro after his junior season came to a close. He won the Hobey Baker Award, which is annually given to college hockey's top player, after registering 80 points (36 goals, 44 points) in just 40 games. His 80 points were the third-highest single-season total in Boston College history and the most of any college hockey player since Peter Sejna's 82-point performance with Colorado College in 2002-03. Gaudreau also tied Paul Kariya's Hockey East record when he authored a 31-game point streak. The Flames inked the Carneys Point, NJ native to a three-year entry-level deal on Apr. 11 and he made his NHL debut on Apr. 13 when the Flames wrapped up their season against the Vancouver Canucks. He scored his first NHL goal in the second period and logged 15:11 of ice time. The Flames drafted Gaudreau in the fourth round of the 2011 NHL Draft.